photo-eye | BLOG: Book Review: A Spectacle And Nothing Strange. Book Review: A Spectacle And Nothing Strange. Book Review A Spectacle And Nothing Strange. By Ahndraya Parlato Reviewed by Adam Bell The pull between immanence and transcendence lies at the heart of any mystic tradition—to be in the world, but also to escape, or see beyond the veil, is essential. A decidedly literal medium, photography has always fought against its grounding in the world. By Ahndraya Parlato. Kehrer Verlag, 2016. A Spectacle And Nothing Strange. Photographs by Ahndraya Parlato. Text by Christian Hawkey. Kehrer Verlag, Heidelberg, Germany, 2016. In English. 104 pp., 56 color illustrations, 11¾x9½". The pull between immanence and transcendence lies at the heart of any mystic tradition—to be in the world, but also to escape, or see beyond the veil, is essential. A decidedly literal medium, photography has always fought against its grounding in the world. On the one hand, practitioners embrace the ambiguity of facts revealed and transformed by the lens, while at the same time reveling in the strange visions that can emerge from the lens. Several years in the making and containing ten years of work, Ahndraya Parlato’s A Spectacle and Nothing Strange poetically explores this tensive relationship. Despite the book’s coy title, the book skirts the boundaries of mystical revelation. If mystics seek to pierce the veil that separates the mundane world from the divine (often revealing them as one and the same), then Parlato has turned our attention to this porous divide, leading us along the oscillating boundary between revelation and plain sight, to see the wonder and the simple fact of the world. A Spectacle And Nothing Strange By Ahndraya Parlato. Kehrer Verlag, 2016. The book’s striking cover is the first clue about the duality explored in Parlato’s work. 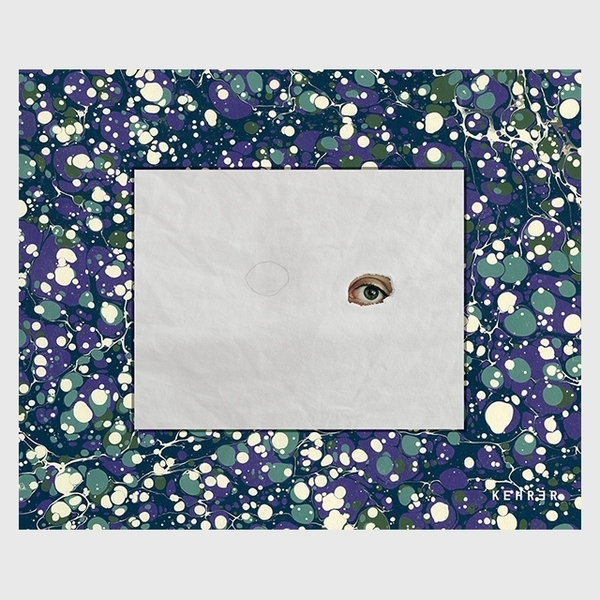 Set against a blue-and-green marbleized cloth cover is an image of an eye. Addressing us inquisitively, the blue eye, which matches the cover, peers through a hole in a white sheet that extends to the edges of the frame. To the left is a pencil outline for the right eye, which remains uncut. What each eye represents or sees is left unsaid. Are these two ways of seeing? Are the revelatory images within those of the eye that peers out, seeing through the veil of reality? A spectacle? Or is the reverse true? Does the eye see the world as it is, factual and true? Nothing strange? Like the rest of the book, there is no judgment or privilege placed on the two poles. In some sense, both are true. Although never made explicit, the work is deeply personal. Parlato’s single mother suffered from mental illness. As a young child, Parlato was often required to navigate between the world she saw and experienced, and the frequently distorted reality of her mother. While the work’s backstory reveals the work’s impetus, it is misleading to read it into the content itself. The book opens with an image of the sky at night. A dark tree looms on the right and the moon blazes across the top of the frame. Star trails streak across the picture. In the next image, a flurry of dandelion seeds, frozen by a flash, appears to assume human-like form. The beam of a flashlight hovers on a worn piece of wood. A sleeping figure lies on a bed. It’s daytime and their eyes are covered. This short sequence, which moves from nighttime visions in the backyard to a home and a dreamlike existence, raises the question, Are we awake or asleep? Throughout the book, mirrors, fabric and smoke play a recurrent role, highlighting a shift or gateway to another version of our world. Solitary figures stand in front of majestically frozen falls, they wade into water, of lay in fields, hovering in stasis. Riotous alien flowers billow out into the landscape and tumultuous water churns in front of a gaping chasm. To Parlato’s great credit, she dispenses with many of the clichés (like crystals, prisms, and rainbows) of recent photographic work that attempt to explore similar terrain. Instead of short handedly invoking the otherworldly, Parlato’s work successfully embodies that experience. Each image remains firmly rooted in the world, but attempts to point beyond itself. Each small moment is a potential trigger to open up a vision of something new, strange or unreal. Designed by the photographer Michael Schmelling, the book’s layout is simple but striking. The book begins conventionally enough with images of varying formats and sizes; single and paired image spreads. Abruptly, select images slide off the page. Whereas most images that bleed to the edge might fill the page and be used to create an impact, these have a hallucinatory affect, like reality shifting under our feet. Midway through the book there is also a single squiggly line—what appear to be a thread—that curls across the left-hand page. Begging to be picked up, it might be the thread that holds the book together, binding these two worlds. All we need to do is pull. The bold placement of the title and text in the book’s front and end pages is a fantastic, almost cinematic, touch. Likewise, the prose/poem by the poet Christian Hawkey is the perfect accompaniment to the work. It dances alongside the work, never oversteps, explains or undercuts the work.